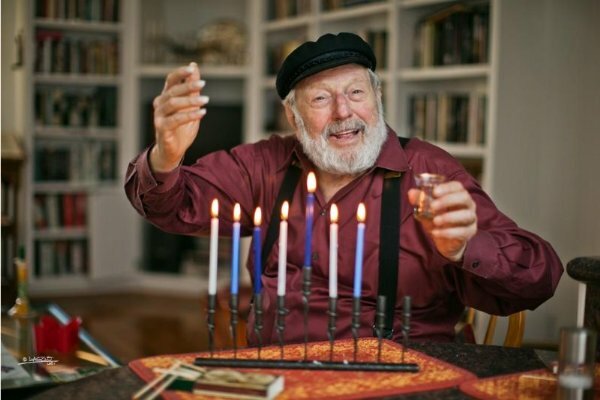 Theodore Bikel, the legendary Jewish actor and folk singer who passed away on Monday at the age of 91, was deeply impacted and intrigued by the Chabad movement, despite his difference of opinion and lifestyle. "Chabad is unique among all the Chassidic sects," he once said. "It holds to an attitude few have ever had before - and it is plainly that of loving Jews, of every stripe and reaching out to touch them without asking questions. All they ask is for open eyes and ears and an open mind. People are reacting to them because they are realizing that their sole purpose is to widen the circle of Jews." Famous for playing the role of Tevye the Milkman during more than 2,200 performances of "Fiddler on the Roof" on Broadway, Bikel also featured Hebrew and Yiddish folk music in his 27 albums. Among them is the song "Az Der Rebbe Zingt" (when the Rebbe sings, so do the chassidim). Bikel was born into a Jewish family in Vienna, Austria and named after Theodor Herzl, the founder of modern Zionism. His family fled to Mandatory Palestine after the German union with Austria in 1938. Bikel started acting while in his teens, studied at the Royal Academy of Dramatic Art in London. In 1954, he moved to the United States. While he was known for activism with many left-wing causes, Bikel was fascinated by the Chabad approach as inspired by theRebbe. Speaking at the Chabad House in Buffalo in the 1970's, he said "Chabad has the most immediate impact on the young" and explored the evolution of Chabad on American campuses and his experience with the movement. "Why am I saying all of this?" he paused and contemplated aloud. "I am after all a secular Jew. What appeals to me about Chabad? It is that I and others like me have not been written off because we are hung up on other things. Chassidim don't intend to convert others but there is nothing in the Book that says you can't make Jews out of Jews." In "Theo: An Autobiography," first published in 1994, Bikel recalls a memorable encounter with Chabad while his 6-year-old son Rob was going to Sunday school at a reform temple in Ridgefield, Connecticut. One time his son came home holding a small candlestick. Asked where he had gotten it, the boy said, "A rabbi with a beard came and gave me this for my sister." Bikel didn't have a daughter then, but he said "I was amazed that the arm of the Lubavitchers had reached out as far as southwestern Connecticut, and even into a reform temple." Another encounter he recalled was during a rally for Soviet Jewry at the foot of the Statue of Liberty when 2 "fairly young" Lubavitchers came over to him wearing "hats that were one size too small for their heads." "You're Theodore Bikel, aren't you?" they asked. "Yes," he replied. "And you are Lubavitch Chassidim." Astonished, they asked: "How did you know?" He explained: "That you are Chassidim is obvious from the way you are dressed. That you are Lubavitcher Chassidim is obvious to me also because if you were any other kind, you would not be mixing with 'goyim' like us." The bochurim ignored the last reference and cut to the chase: "We were wondering if you already put on tefillin today." Bikel said he hadn't that day or any other day in a long while. He said he would be willing but asked if it wouldn't be considered hypocrisy on his part. "Would it not be hypocritical if, for the sake of showing off, I were to publicly perform this religious ritual?" They said no, the Rebbe believed that performing one Mitzvah will surely lead to another. And that's what happened. Once Bikel rolled up his left sleeve and put on Tefillin, he said, "I thought, I might as well daven the morning prayer -- this partial thing was already working." Theodore Bikel's most public encounter with the Rebbe was 11 Nissan 5742 (1981) at a large farbrengen marking the Rebbe's 80th birthday at the main shul at Lubavitch Headquarters - 770 Eastern Parkway in Brooklyn, NY. Bikel was brought by his friend, Rabbi Avraham Shemtov, Shliach to Philadelphia and Washington, DC, who brought many dignitaries to the Rebbe. Acknowledging Bikel's unique status as a cohen, the Rebbe made an unusual special request which Mr. Bikel enthusiastically obliged. Following which the Rebbe gave him a motivating instruction. Bikel died on July 21, 2015, at UCLA Medical Center in Los Angeles as a result of natural causes. He once said in an interview that he had planned the inscription for his tombstone – "He Was the Singer of His People" – in Yiddish.